Hands On Math with Math By Hand. Do you believe in math? Do you believe your child is a math genius? Believe it. Every child is. Open the door to that genius by sparking math creativity, excitement, and fun: math-ability! Math By Hand Hands On Math is a Waldorf-inspired, hands-on, complete math curriculum for grades 1-4. Lesson plans and activities plus all the materials you and your child need to make your own learning tools are included. You will find stories, games, form drawing, singing, recitation, movement, art and more, inside. 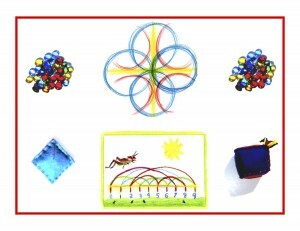 Ideal for Hands On Math, all materials are provided for child-created, parent-guided learning tools. A companion binder contains clearly outlined instruction and guidelines, as well as correlations with math standards and benchmarks. Form drawing and language arts are woven into all aspects of the main lessons and daily math movement activities and skills practice. Marin Lipowitz, an experienced Waldorf teacher, created Hands On Math, Math By Hand for all teachers/parents, at home or in the classroom. It’s teacher-ready to go, right out of the box, with all materials and lessons needed for the best math year ever! Math By Hand engages the whole child. Joyful movement is built into every lesson. Digital, sedentary learning is not the best in the lower grades; it takes the active child’s play out of childhood. Learning by doing is key! Math By Hand is hand made by Marin and her husband Richard. Or by you and your child, with quality materials in 4 kits for each grade. Creating learning tools by hand results in a powerful incentive to learn through ownership. Marin and Richard are committed to assembling all the “By Hand” products here, using materials that are made and/or distributed in the USA. Fabric, yarn, natural wood, and glass are just a few of Math By Hand’s quality ingredients.